I'm a bit behind on my blog, as well as the 23 things. My library was closed for 2 days last week due to a plumbing problem. I was farmed out to another branch for one day and spent the second shelving books all day, trying to catch up on some of the backlog. So, no time for the exploration of new technologies. But check out this great photo display of the hole they dug behind the library! So, Flickr. I've used it before only to view photos that others, mostly my sister-in-law, have posted and then sent me the link to. I hadn't used it as a searching tool until today. I found lots of great pictures when I used the search term "quilt," and I will remember that next time I am looking for inspiration in my own quilting projects. I also tried the PLCMC tag, and saw lots and lots of photos from Imaginon and the technology summit. Now, I'm in a bit of a quandary. Part of my "assignment" is to post a picture from Flickr, yet photo etiquette dictates that I not use photos of other people or that other people took without their permission, and I agree wholeheartedly with these guidelines. I could use one of the PLCMC photos, but most of them have people in them. So, this is a picture that my sister-in-law, Heather took. 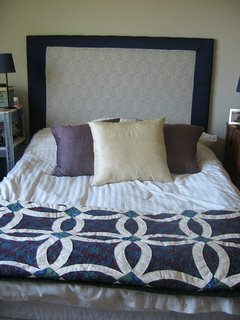 The quilt on the bed is what I gave Heather & Jimmy (my brother) for a wedding present. Heather made the headboard, and she dyed those pillow cases with beet juice. I know you should be able to post a picture directly from Flickr, but I couldn't figure out how to do that, so I did the old-fashioned "save it to a file and post it from there" method. Do you need to have an actual Flickr account to post photos directly into your blog? So, I set up a blogger account to enable me to comment on Blogger blogs. The "old-fashioned" method for posting pictures works just fine and yes, you can post directly from Flickr. As far as I know you do need an account to do that though. I'm glad to know that the "plumbing problems" are taken care of at the library.